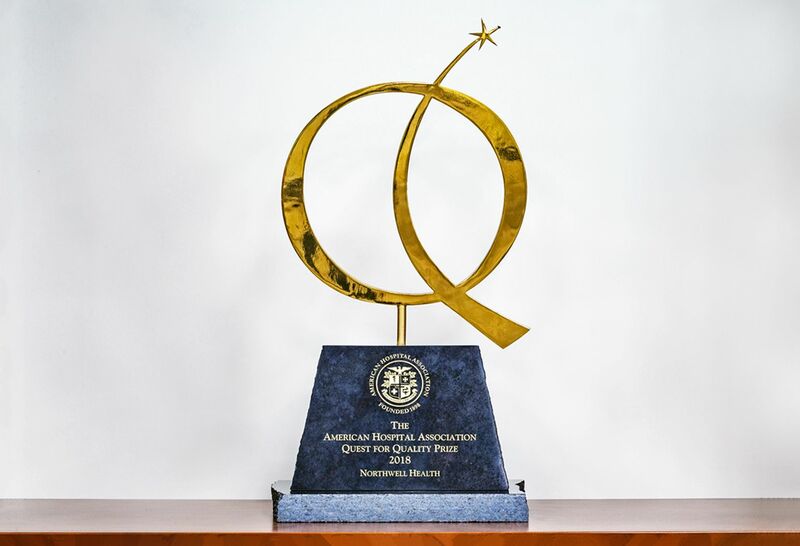 Northwell Health earned the American Hospital Association's Quest for Quality Prize, becoming the first health system to achieve the feat. Top 50 Cardiovascular Hospitals IBM Watson Health. Magnet Designation for Nursing Excellence American Nurses Credentialing Center (ANCC). Mission Lifeline Emergency Medical Services (EMS) Bronze Receiving Plus Recognition Award American Heart Association (AHA). Comprehensive Community Cancer Program American College of Surgeons (ACoS), Commission on Cancer (CoC). Disease Specific Care Certification (DSC) Spine Surgery The Joint Commission (TJC). Disease Specific Care Certification (DSC) Advanced Ventricular Assist Device The Joint Commission (TJC). Disease Specific Care Certification (DSC) Advanced Comprehensive Stroke Center The Joint Commission (TJC). Disease Specific Care Certification (DSC) Advanced Total Hip and Knee Replacement The Joint Commission (TJC). Disease Specific Care Certification (DSC) Joint Replacement Hip and Knee The Joint Commission (TJC). Disease Specific Care Certification (DSC) Advanced Palliative Care The Joint Commission (TJC).